There are several legends about how St. Andrew became the patron saint of Scotland. One tradition states that the monk Regulus was visited by an angel who commanded him to take the relics of St. Andrew from Constantinople to the land of the Picts. There he met a King of the Picts and founded a church at modern day St. Andrews (previously Kilrymont). Another legend is that during a battle at modern day Athelstaneford, King Angus Mac Fergus saw a cloud shaped like a saltire against a blue sky. He declared that St. Andrew was watching over them and that if they won the battle, he would make St. Andrew their patron saint. This is the story behind the use of the Saltire, the national flag of Scotland. St. Andrew is the patron saint of Scotland, Ukraine, Russia, Sicily, Greece, Romania, the Philippines, Amalfi, Malta, and the former Prussia. 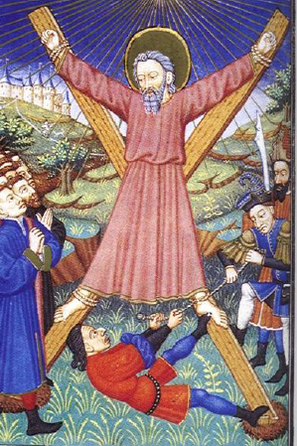 St. Andrew is a patron saint for many professions, including the Army Rangers, mariners, fishermen, fishmongers, rope-makers, singers, golfers, and performers. November 30th is celebrated as 'St. Andrews' Day in Scotland and is officially recognized as a 'national day' also. The day is also a bank holiday and most businesses are closed. The SSAS of Greater St. Louis holds a St. Andrew's Day celebration on or near November 30th so check out the Events menu for more information!